Popular education is a concept grounded in notions of class, political struggle, and social transformation. The term is a translation from the Spanish educación popular or the Portuguese educação popular and rather than the English usage as when describing a 'popular television program', popular here means 'of the people'. More specifically 'popular' refers to the 'popular classes', which include peasants, the unemployed, the working class and sometimes the lower middle class. The designation of 'popular' is meant most of all to exclude the upper class and upper middle class. Popular education is used to classify a wide array of educational endeavors and has been a strong tradition in Latin America since the end of the first half of the 20th-century. These endeavors are either composed of or carried out in the interests of the popular classes. The diversity of projects and endeavors claiming or receiving the label of popular education makes the term difficult to precisely define. Generally, one can say that popular education is class-based in nature and rejects the notion of education as transmission or 'banking education'. It stresses a dialectic or dialogical model between educator and educand. This model is explored in great detail in the works of one of the foremost popular educators Paulo Freire. Though sharing many similarities with other forms of alternative education, popular education is a distinct form in its own right. In the words of Liam Kane: "What distinguishes popular education from 'adult', 'non-formal', 'distance', or 'permanent education', for example, is that in the context of social injustice, education can never be politically neutral: if it does not side with the poorest and marginalised sectors- the 'oppressed' – in an attempt to transform society, then it necessarily sides with the 'oppressors' in maintaining the existing structures of oppression, even if by default." Popular education began at the crossroads between politics and pedagogy, and strongly relies on the democratic ideal of the Enlightenment, which considered public education as a main tool of individual and collective emancipation, and thus the necessary conditions of autonomy, in accordance to Immanuel Kant's Was Ist Aufklärung? (What is Enlightenment? ), published five years before the 1789 French Revolution, during which the Condorcet report established public instruction in France. Jean-Jacques Rousseau's L'Emile: Or, On Education (1762) was another obvious theoretical influence, as well as the works of N. F. S. Grundtvig (1783–1872), at the origins of the Nordic movement of folk high schools. During the 19th century, popular education movements were involved, in particular in France, in the Republican and Socialist movement. A main component of the workers' movement, popular education was also strongly influenced by positivist, materialist and laïcité, if not anti-clerical, ideas. One of the roots of popular education was the Condorcet report during the 1789 French Revolution. These ideas became an important component of the Republican and Socialist movement. Following the split of the First International at the 1872 Hague Congress between the "anti-authoritarian socialists" (anarchists) and the Marxists, popular education remained an important part of the workers' movement, in particular in the anarcho-syndicalist movement, strong in France, Spain and Italy. It was one of the important theme treated during the 1907 International Anarchist Congress of Amsterdam. During the Second Empire, Jean Macé founded the Ligue de l'enseignement (Teaching League) in 1866; during the Lille Congress in 1885, Macé reaffirmed the masonic inspiration of this league devoted to popular instruction. Following the 1872 Hague Congress and the split between Marxists and anarchists, Fernand Pelloutier set up in France various Bourses du travail centres, where workers gathered and discussed politics and sciences. The Jules Ferry laws in the 1880s, establishing free, laic (non-religious), mandatory and public education, were one of the founding stones of the Third Republic (1871–1940), set up in the aftermaths of the 1870 Franco-Prussian War and the Paris Commune. Furthermore, most of the teachers, who were throughout one of the main support of the Third Republic, so much that it has been called the République des instituteurs ("Republic of Teachers"), while the teachers themselves were called, because of their Republican anti-clericalism, the hussards noirs de la République, supported Alfred Dreyfus against the conservatives during the Dreyfus Affair. One of its consequences was for them to set up free educational lectures of humanist topics for adults in order to struggle against the spread of anti-semitism, which was not limited to the far-right but also affected the workers' movement. Paul Robin's work at the orphanage in Cempuis was the model for Francisco Ferrer's Modern School in Spain. Robin taught atheism and internationalism, and broke new ground with co-ed schooling, and teaching orphans with the same respect given to other children. He taught that the individual should develop in harmony with the world, on the physical, moral, and intellectual planes. In Denmark, the concept of folk high school was pioneered in 1844 by N. F. S. Grundtvig. By 1870, Denmark had 50 of these institutions. The first in Sweden, Folkhögskolan Hvilan, was established in 1868 outside of Lund. In 1882, liberal and socialist students at Uppsala University in Sweden founded the association Verdandi for popular education. Between 1888 and 1954 it published 531 educational booklets on various topics (Verdandis småskrifter). A Swedish bibliography on popular education with 25,000 references to books and articles between 1850 and 1950 is integrated in the Libris catalog of the Royal Library. Popular education continued to be an important field of socialist politics, reemerging in particular during the Popular Front in 1936–38, while autogestion (self-management), a main tenet of the anarcho-syndicalist movement, became a popular slogan following the May '68 revolt. The Escuela Moderna (Modern School) was founded in 1901 in Barcelona by free-thinker Francesc Ferrer i Guàrdia, and became a leading inspiration of many various movements. Opposed to the "dogmas of conventional education Ferrer set a system based on reason, science, and observation." The school's stated goal was to "educate the working class in a rational, secular and non-coercive setting". In practice, high tuition fees restricted attendance at the school to wealthier middle class students. It was privately hoped that when the time was ripe for revolutionary action, these students would be motivated to lead the working classes. It closed in 1906. The Escuela Moderna, and Ferrer's ideas generally, formed the inspiration for a series of Modern Schools in the United States, Cuba, South America and London. The first of these was started in New York City in 1911. It also inspired the Italian newspaper Università popolare, founded in 1901. 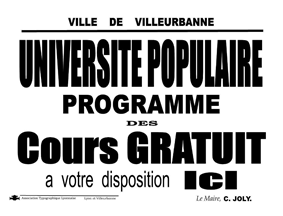 List of lectures, Université populaire – town of Villeurbanne – 1936. Following the autogestion (or self-management): this high school took the name of Lycée autogéré de Paris (LAP). The LAP explicitly modelled itself after the Oslo Experimental High School, opened in 1967 in Norway, as well as the Saint-Nazaire Experimental High School, opened six months before the LAP, and the secondary school Vitruve (opened in 1962 in the 20th arrondissement of Paris, still active). Theoretical references include Célestin Freinet and his comrades from the I.C.E.M., as well as Raymond Fonvieille, Fernand Oury, and others theoreticians of "institutional pedagogy", as well as those coming from the institutional analysis movement, in particular René Lourau, as well as members of the institutional psychotherapeutic movement, which were a main component in the 1970s of the anti-psychiatric movement (of which Félix Guattari was an important member). Since 2005, the LAP has maintained contact with self-managed firms, in the REPAS network (Réseau d'échanges et de pratiques alternatives et solidaires, Network of Exchange of Solidarity and Alternative Practices"). A second generation for such folk high school meant to educate the people and the masses spread in the society (mainly for workers) just before the far-right leagues. Issues devoted to free-thinking such as workers' self-management were thought and taught during that time, since the majority of attendants were proletarians interested in politics. Hence, some received the name of Université prolétarienne (Proletarian University) instead of Université populaire (Popular University) in some cities around the country. The reactionary Vichy regime put an end to such projects during World War II. The second generation continued in the post-war period, yet topical lectures turned to be more practical and focused on daily life matters. Nowadays, the largest remnant is located in Bas-Rhin and Haut-Rhin départements. Following World War II, popular teaching attempts were initiated mainly by the anarchist movement. Already in 1943, Joffre Dumazedier, Bénigno Cacérès, Paul Lengrand, Joseph Rovan and others founded the Peuple et Culture (People and Culture) network, aimed at democratization of culture. Joffre Dumazedier conceptualized, at the Liberation, the concept of "cultural development" to oppose the concept of "economic development", thus foreshadowing the current Human Development Index. Historian Jean Maitron, for example, was director of the Apremont school in Vendée from 1950 to 1955. Such popular educations were also a major feature of May '68 and of the following decenie, leading in particular to the establishment of the University of Paris VIII – Vincennes in Paris, in 1969. The Vincennes University (now located in Saint-Denis) was first a "Experimental University Center," with an interest in reshaping relations between students and teachers (so-called "mandarins", in reference to the bureaucrats of Imperial China, for their authority and classic, Third Republic pedagogy) as well as between the university itself and society. Thus, Vincennes was largely opened to those who did not have their baccalauréat diploma, as well as to foreigners. Its courses were focused on Freudo-Marxism, psychoanalysis, Marxist theory, cinema, theater, urbanism or artificial intelligence. Famous intellectuals such as Gilles Deleuze, Michel Foucault, Jacques Lacan and others held seminars there, in full classrooms where no seats could be found. The assistance was very heterogeneous. For instance, musicians such as Richard Pinhas assisted at Deleuze's courses, and after having written the Anti-Oedipus (1972) with Félix Guattari, Deleuze used to say that non-specialists had best understood their work. Furthermore, Vincennes had no amphitheatres, representatives of the mandarin teacher facing and dominating several hundred students silently taking notes. It also enforced a strict equality between professors and teaching assistants. The Student Revolt continued throughout the 1970s in both Vincennes and the University of Paris X: Nanterre, created in 1964. In 1980, the Minister of Education Alice Saunier-Seité imposed the transfer of Vincennes' University to Saint-Denis. Although education was normalized in the 1980s, during the Mitterrand era, in both Saint-Denis and Vincennes, these universities have retained a less traditional outlook than the classic Sorbonne, where courses tend to be more conservative and sociological composition more middle-upper class. Another attempt in popular education, specifically targeted towards the question of philosophy (France being one of the rare country where this discipline is taught in terminale, the last year of high school which culminate in the baccalauréat degree) was the creation, in 1983, of the open university named Alain Badiou, Sidi Mohamed Barkat, Geoffrey Bennington, François Châtelet, José Gil, Olivier LeCour Grandmaison, Antonio Negri, and others. The Ciph is still active. In 2002 philosopher Michel Onfray initiated Université populaire de Caen in his hometown and starting a long seminar dealing with hedonistic philosophy from ancient times to May'68 events in French society, for at least ten years. His very topical subject in this seminar keeps going with a free-thinking spirit, since people are invited on the whole to rethink the history of ideas to eliminate any Christian influence. Despite the same name of Université populaire, it is not linked to the European federation of associations inherited from the second generation. In 2004, Onfray expanded the experience to other cities such as Arras, Lyon, Narbonne, Avignon, and Mons (in Belgium) ; each with various lectures and teachers joining his idea. The Universités populaires in Argentan is meant to deliver a culture of culinary tastes to nonworking people, through lectures and practises of famous chefs. Popular education is most commonly understood as an approach to education that emerged in Latin America during the 1930s. Closely linked with Marxism and particularly Liberation theology. Best known amongst popular educators is the Brazilian Paulo Freire. Freire, and consequently the popular education movement in Latin America, draws heavily upon the work of John Dewey and Antonio Gramsci. One of the features of popular education in Latin America has been participatory action research (PAR). In the United States and Canada popular education influenced social justice education and critical pedagogy, though there are differences. At the same time, however, there are examples of popular education in the U.S. and Canada that grew up alongside and independently of popular education in Latin America. Scholar and community-worker Myles Horton and his Highlander Folk School (now Highlander Research and Education Center) and his work in Tennessee can be classified as popular education. Horton's studies at Union Theological Seminary in New York under Reinhold Niebuhr in the 1920s parallels the emergence of liberation theology in Latin America and both are heavily influenced by socialism and a focus on the practical relationships between Christianity and everyday life. Niebuhr, however, was a staunch anti-communist while liberation theology has a much closer relationship to the work of Karl Marx. Additionally, popular education has been linked to populism and land-grant universities with their cooperative extension programs. The connection between popular education and Marxism, unfortunately, undermined a great deal of its influence as a result of McCarthyism and the red scare during the Cold War. Nevertheless, Highlander Folk School, for example, played a significant role in the civil rights movement providing a space for leaders to consult and plan. ^ Kane, Liam (2001). Popular Education and Social Change in Latin America. Nottingham, UK: Russell Press. p. 9. ^ SFbB, Svensk folkbildningsbibliografi (1850–1950). ^ Avrich, Paul (2006). The Modern School Movement: Anarchism and Education in the United States. Edinburgh, UK: AK Press. p. 19. ^ He also published [a book] as a manifesto to describe his hopes about it: La communauté philosophique. ^ The first lecture at Argentan was delivered by the main chef of Crillon motel; Onfray commented on radio he liked to enable such extravagant encounters. Rubenson, K (1995) Vad är folkbildning in Folkbildningens innebörder. Linköping: Mimer.